I would like to place an overlay picture on a page without disturbing the rest of the page's content. However, when I put the source code for the overlay picture above or below a section command, either the section header or the following text are shifted downward. Can this be circumvented? Or is there maybe another, entirely different way for placing additional text above/below the regular page content? Both, the section header and this text, are shifted because of the overlay TikZ pictures. Even though a tikzpicture with overlay has zero size, it's still there, as far as TeX is concerned. So you have "something" on a line, then \section, which starts a new paragraph. After the \section you again have something, then a paragraph break, then the text. If you place both tikzpictures immediately before the text after \section, without any spaces or empty lines, you'll get what you're after. Or just as well, use just one tikzpicture. The frame is from the showframe package. No spaces or paragraph breaks around the tikpicture, so no apparently empty lines, and thus no shifting. 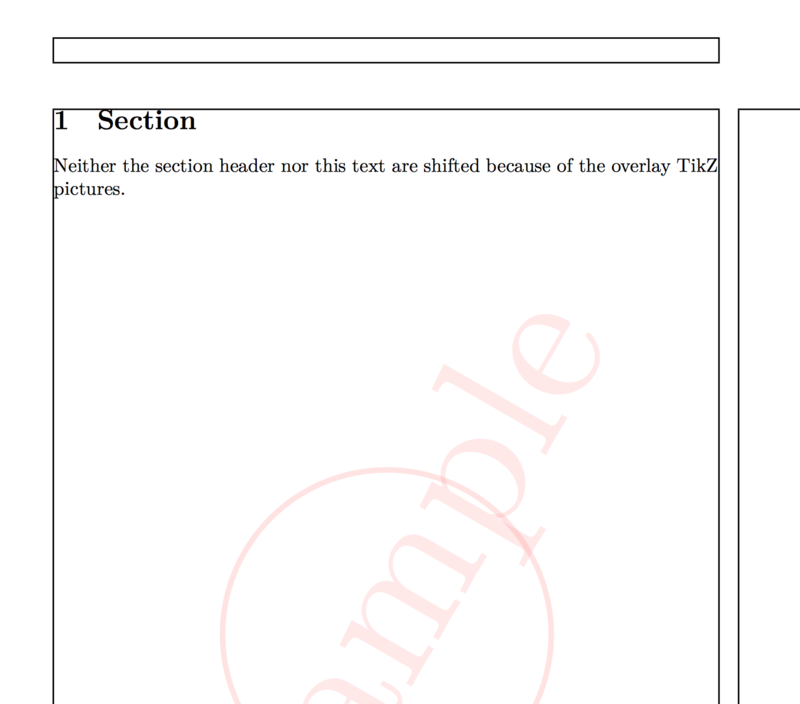 Neither the section header nor this text are shifted because of the overlay TikZ pictures. No background on this page. Not the answer you're looking for? Browse other questions tagged tikz-pgf overlays or ask your own question.